A frequency Counter is measuring instrument, that is used to measure or count the Frequency.These instrument mostly measure the number of pulses per second in periodic electronic signal.Frequency counters are work by using counter which accumlate the pulses occring with the period (mostley 1 second). 8051\AT89C51\S5x based frequency meter uses LCD 16x2 and measure square wave frequency upto 256 Hz, it uses crystal of 11.0592MHz and input frequency is applied to T1 (pin15) of Microcontroller. 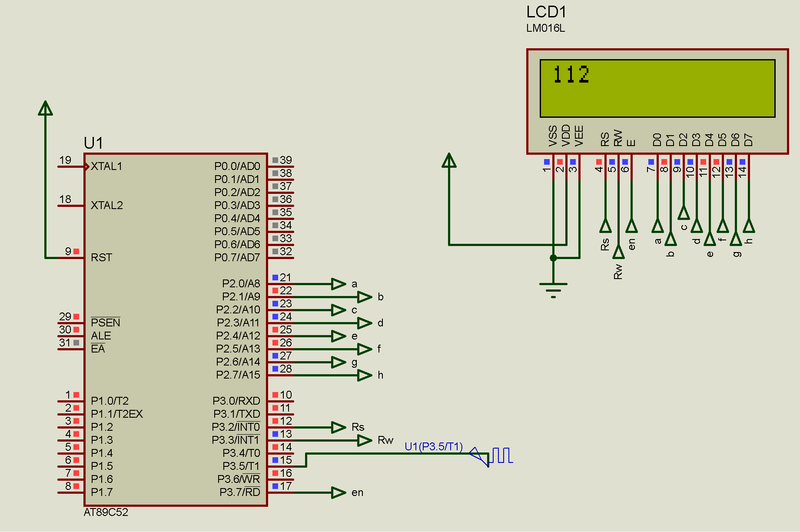 Both Timers are used in this circuit, Timer 0 is configured in mode 1 operation (16 bit) as timer while timer 1 is configured as 8 bit auto reload counter mode. pulses are fed to T1 pin of 8051 which is connected to TL1, all the pulses are stored in TL1, Timer 0 is configured in 16 bit mode 1 operation this time will over flow 14 times (the value of R6 is 14).